WHY DOES THE 'WOODYATT FORMULA' YIELD THE BEST KETOGENIC RATIO? Ketogenic diets are characterized by minimized intake of carbohydrates. When the amount of carbohydrates is low enough in relationship to the fat in the diet, this causes the body to start producing molecules called 'ketones' from fat which the body uses for energy instead of glucose. This is known as being in 'nutritional ketosis,' which means that the body is in fat-burning mode.The more ketogenic a diet is, the more it utilizes the burning of fat for metabolism rather than glucose. Ketogenic diets have been demonstrated to have the ability to trigger burning fat without the loss of muscle mass (Ackerson, n.d,), and reviews of the medical research literature report a wide range of additional health benefits from ketogenic diets (Paoli, Rubini, Volek & Grimaldi, 2013). Some of these health benefits include eliminating or improving diabetes (Saslow et al,, 2017), cancer (Klement, 2017), as well as as well as improving neurological function and helping eliminate or improve epilepsy (Neal et al., 2009) or psychiatric disorders (Ede, 2017). In modern times, aggressive efforts by the pharmaceutical industry to popularize drug treatments have caused many to ignore the existence of side-effect-free natural approaches to managing diabetes, epilepsy and a growing number of other diseases. In the pre-medication era, the effectiveness of ketogenic diets in helping with such disorders was first demonstrated in the 1920’s by Rollin T. Woodyatt, M.D. (Root, 1955). Woodyatt's research caused him to receive the 1948 Banting Medal for Scientific Achievement, which is the highest scientific award of the American Diabetes Association (American Diabetes Association, n.d.). Where KR is “ketogenic ratio,” g is grams, P is protein, F is fat, and C is CHO. Wilder and Winter (1922) defined the threshold of ketogenesis explaining it from the standpoint of condition where either ketone bodies or glucose can be oxidized. They arrived, together with Shaffer and Woodyatt, at the conclusion that KR for induction of ketogenesis should be 2:1 or higher. This is a very important point, not only methodologically, but also ideologically. The KR invariably indicates whether the CHO proportion is low enough for allowing the fat-mobilizing pathway and ketogenesis, or high enough for blocking it and supporting glycolysis instead." Thus, as can be seen by Woodyatt's formula above, how ketogenic one's food is depends on varying amounts of contribution from ketogenic macronutrients (portions of protein and fat) versus glucogenic macronutrients (portions of carbohydrate, protein and fat). Woodyatt's formula acknowledges that proteins, fats and carbohydrates make different contributions to the degree of ketosis, but many mistakenly use another popular keto-ratio formula which wrongfully assumes that protein is equally anti-ketogenic as carbohydrate. This simplified faulty approach adds protein and carbs together in a ratio against fat, which can cause one to easily underestimate the amount of protein needed to maintain adequate muscle mass for a given ketogenic ratio. Popular web-based calculators using this flawed approach include KetoCalculator, described in a paper published in the journal Epilepsia (Zupec-Kania, 2008). 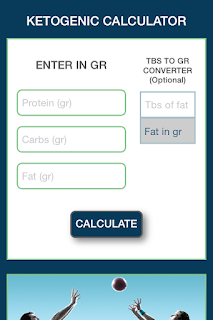 As explained here, the ketogenic ratio that KetoCalculator yields "is the relationship between grams of fat to the combined grams of protein and carbohydrate," an incorrect assumption that may underestimate the amount of protein which may harm especially growing children. Does Woodyatt's Formula Have Shortcomings? Woodyatt's formula can only calculate a ketogenic ratio based on the ketogenic/glucogenic attributes in food, while one's actual level of ketosis would depend on one's individual metabolism (how much glucose and fat the body actually burns). In the case that one consumes less calories than one burns for energy, some of the fat burnt would be coming from the body's own storage reserves instead of from food, which can cause one's actual degree of ketosis to be higher than the ratio for the food indicated by Woodyatt's formula. For example, an obese man can be put on what is called a 'protein sparing fast' for a few days, meaning he only eats protein three times a day and nothing else. He could end up in deep ketosis due to burning a lot of fat coming from his own body's storage reserves only instead of from food, despite the Woodyatt formula not showing ketosis based on his fat-free diet. But since the actual degree of ketosis can only be greater than that indicated by Woodyatt's ratio and cannot be less, the formula can still not cause one to believe one is ketogenic when one is not. 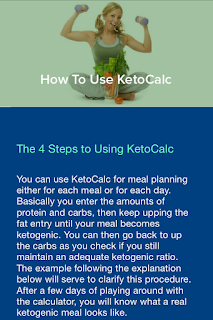 In summary, if one is using up the body's stores for fat, one can only be more ketogenic than the amount Woddyatt's formula indicates, never less. The research literature contains papers which point out the above, stating that Woodyatt's ketogenic ratio can indicate the actual degree of ketosis only in "isocaloric conditions" where the amount of calories consumed equals the amount of calories one's body burns (Cohen, 2009). Such papers have suggested adjustments to the original formula which we have not implemented due to their controversial and possibly inaccurate nature. 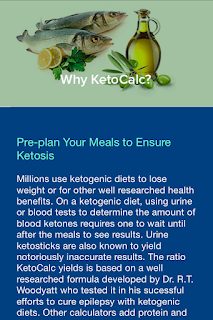 While Woodyatt's formula lets one accurately PRE-PLAN ketogenic meals, conventional tools such as urine tests, painful blood tests or expensive breath ketone analyzers let one see if one is in nutritional ketosis AFTER one's meals. The Internet contains independently posted modern-day success stories (Korsunsky, 2016) utilizing Woodyatt's formula using the KetoCalc app. 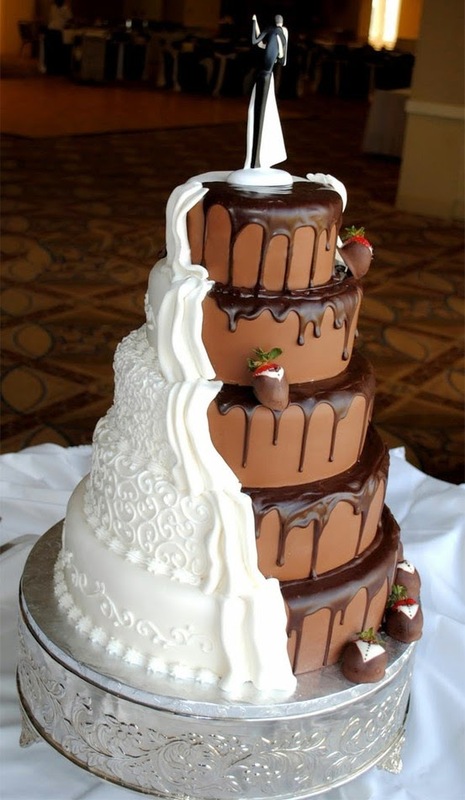 Last night, I saw a picture of a wedding cake and thought about the usefulness of KetoCalc for those who had slipped and wanted to get back on track as fast as possible without going through the keto-adaptation period again. Then I found myself facing with a slightly similar situation. I was craving a nice, full bowl of yogurt but it had 15 grams of carbs. I had been mostly ketogenic for many months, having lost weight from 275 lbs to my current weight of 165 lbs. If I went out of ketosis, I did not want my body to require another period of adaptation before burning ketones again. So I put my macros in the calculator. The yogurt had 14 grams of fat, 15 grams of carbohydrate, and 9 grams of protein. I added in 25 grams of whey protein bringing the total protein up to 34 grams. That gave me a keto-ratio well below 1 which is not ketogenic. 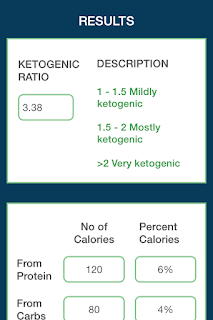 So I went back (using the back arrow at the bottom of my Android to leave my previously entered values intact) and kept increasing the fat amount in the calculator until the ketogenic ratio was over 2. I did this by putting in different numbers of tablespoons of oil into the Tablespoon to Gram Converter field of the calculator and adding the oil amount in grams to the 14 grams of fat in my yogurt, re-entering the total amount of fat and pressing calculate again. I first put in 3 tablespoons of oil into the Tablespoon to Gram Converter field which yielded 40 grams of oil to add, giving me 54 grams of total fat, which yielded a ketogenic ratio of 1.60 – still too low. Then I tried 5 tablespoons of oil to add (67 gr.) yielding 81 grams of total fat, and got a ketogenic ratio of 2.07. I was happy with this ratio. This is how I determined how much additional oil or fat was needed for my meal to remain ketogenic. Please be advised to do the above as rarely as possible, as the excessive number of calories may lead to weight gain.